CCAC 2018, Conscious Capitalism’s annual conference, wrapped up 2 weeks ago in Dallas, TX leaving the 800+ conscious leaders enlightened and inspired. The conference included a variety of keynotes and breakout sessions over three days, where new and familiar leaders shared their stories and experiences in using business as a force for good. For the unfamiliar, Conscious Capitalism’s Annual Conference brings leaders from around the world together to elevate humanity through business. 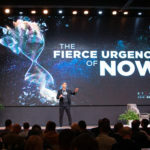 Conscious Capitalism’s annual conference has posed as an internal checkpoint for several businesses, including Stagen, to ensure an organization’s daily functions are aligned with a higher purpose. Beyond the diversity of organizations, industries, strategies, and experiences, we come together for this event with a shared goal of creating a business as a force for good. We left the conference inspired, challenged, and motivated. And it was a lot of fun connecting with many of our members and member companies. Below, you will find a few of our favorites that we’ve compiled and summarized for you. 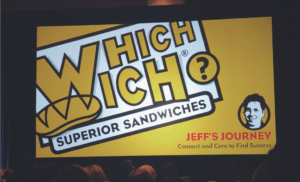 Jeff Sinelli, Founder and Chief Vibe Officer of Which Wich, captivated the audience by walking us through “Jeff’s Journey”, the story of how he landed on Which Wich. Jeff’s journey teaches us that discovering your values, passions, and beliefs changes all aspects of your life. Conscious Capitalism thrives on this notion as one of the most effective ways to see your business succeed. 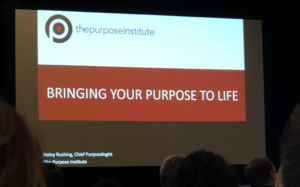 Haley Rushing, Chief Purposologist of The Purpose Institute, hosted a smaller practicum on realizing your purpose and bringing it to life. 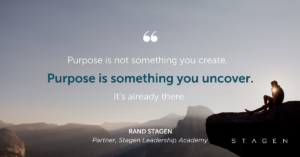 Her research directly complements one of Stagen’s main topics covered throughout the Integral Leadership Program of discovering both your individual and organization’s purpose. Humans need purpose and meaning to find fulfillment throughout our lives. Beyond our human nature, society also sets an expectation to find a higher purpose as an individual and as a business. You are given the responsibility to discover what drives you and gives you life. Haley also highlighted the importance of drive as you discover your purpose. What motivates you in finding your purpose? John Mackey, CEO of Whole Foods and one of the Founders of Conscious Capitalism, and Ed Freeman, the “father” of stakeholder theory, closed out the conference with a powerful dialogue on the challenges that come with the associations society places on the relationship between a business and its stakeholders. Businesses have always and will always have a direct impact on each of their numerous stakeholders. At the core of any successful business structure, we cooperate as a unit to create value for our stakeholders and assist them in solving problems. 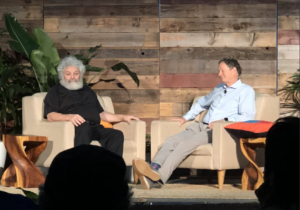 Ed Freeman and John Mackey emphasize the importance of a business’s responsibility to ensure that all stakeholders are accounted for. At Stagen, we exist to help business be a force for good. We serve leaders who recognize the power of indefinite time horizons, and who feel called to use their organizational platforms for long-term positive impact. We’re honored to be involved with such an impactful organization like Conscious Capitalism that is helping businesses do good in the world. We’re already looking forward to next year’s conference and hope to see you there!